Just like dental care can slow, stop, and reverse dental problems, effective chiropractic care can slow, stop, and reverse spinal degeneration. Phase 1: Joint Dysfunction - This phase is like having a locked, rusty hinge in one of your spinal joints. Your early episode of pain in your back or neck is this joint dysfunction. This begins your 20's or 30's. 70-80% of all chiropractic patients are in the joint dysfunction phase. Our treatments in Phase 1 are specific spinal adjustments to the locked joint which can quickly return you to pain free and improved function. However, if the damage from the causes of spinal degeneration, such as an injury, is greater than your body's ability to repair, Phase 1 may lead to Phase 2. Phase 2: Joint Instability - This phase is like a floppy joint or bulging disc misaligned out of normal position - like a rock in your shoe. This is the phase for those of you who are in the 40's, 50's to 60's who have degenerated due to too much motion in the joints (hypermobility). Swelling, inflammation, muscle spasms, disc protrusion, pinched nerves, visceral, and even psychological problems are some the results of Phase 2 joint instability. Our treatments of this unstable joint are different from the treatment of a locked joint. An unstable joint requires stabilizing exercise, support, inflammation management and longer time with spinal adjustments. Phase 2 joint instability also may require medical consultation for injections and/or medication concurrently with your conservative chiropractic care of this painful process. As Phase 2 is late stage spinal degeneration, relief from our treatments can be expected, but you may experience day to day mild symptoms. If you do not keep up your stretching, exercise, diet and good "body mechanics", you may have painful flair-ups from time to time. 20% of chiropractic patients are in this joint instability phase. Phase 3: Joint Stabilization - This phase is mostly bone, where the joint space used to be. 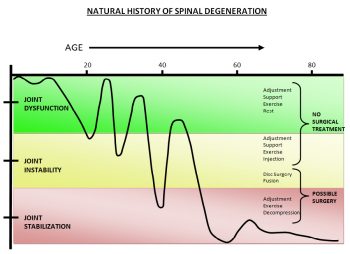 This is the late stage of spinal degeneration for those in their 70's to 90's. The spine has stiffened and joints have calcified due to decades of continual progressive degeneration. This results in a more "stabilized" spine and may explain why there is minimal back pain in this age group. For a very unfortunate few, the degenerative spurs of the spine press down on the spinal cord and/or the nerves (stenosis), and chronic back and/or leg pain results. At this age, it is possible to have joints of the spine stabilized, other sections unstable, and even other areas in the initial phase of dysfunction. These probabilities will be assessed by the examination.